Runtime Software has teamed up with Knoppix, the Linux-based bootable live system. Already used by Millions around the world, the Knoppix Live CD features automatic hardware detection and support for many network adapters, graphic cards, hard disk controllers, SCSI and USB devices, and other peripherals. Boot from the Runtime Live CD and recover your data. Ready-To-Use Recovery Environment The Runtime Live CD is ready-to-use and preinstalled with all our data recovery tools: * GetDataBack for FAT * GetDataBack for NTFS * DiskExplorer for FAT * DiskExplorer for NTFS * DiskExplorer for Linux * Captain Nemo Pro * NAS Data Recovery * RAID Recovery for Windows * RAID Reconstructor * DriveImage XML (Private Edition) * DiskDigger The Live CD is an ideal recovery environment as it is Linux-based, and therefore less prone to a Windows tendency to manipulate and change Windows-formatted disks. This reduces the risk of overwriting data that you want to recover, especially on Windows boot disks (C:). 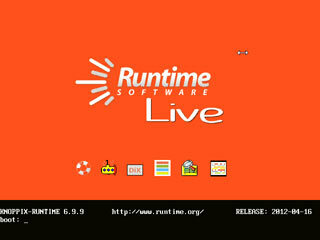 The Runtime Live CD is an alternative to our WinPE boot CD. The Live CD provides access to network resources and the Internet. We provide the Runtime Live CD free of charge for users of our data recovery software. To create the Runtime Live CD, Download the ISO image of the Runtime Live CD Burn it onto a CD-Rom Reboot your computer from that CD into the Runtime Live CD desktop. Windows data recovery software with powerful data recovery abilities to undelete files and recover lost data from hard drives with damage/formatted/lost partition under Windows. Transfer Android SMS to iPhone directly. No Root/Jailbreak required. Backuptrans iPhone SMS to Android Transfer supports Android SMS messages to iPhone transfer directly. This site does not contain serial number, crack, keygen Runtime Live CD serial number : serial number is the simplest type of crack. A serial number(cdkey,product key,etc) is register the program as you may already know. a crack or keygen may contain harmful software. If you cannot find the exact version you want, just give it a try. for more information read .nfo/.txt/.diz file include in zipped file.